I received the new book Hamlet Made Simple and Other Essays by David P. Gontar and began thumbing through its 428 pages when, on the heels of a discussion of Sonnet 116, I found some very kind words about The Monument, my edition of the Sonnets as by the Earl of Oxford. There are eighteen essays in Hamlet Made Simple, preceded by a substantial introduction and followed by a final section in conclusion. I look forward to delving into it. And thanks to David Gontar for his kind remarks. David P. Gontar, Ph.D., J.D., served as Assistant Professor of Philosophy and Humanities at Southern University from 1975 to 1982. Thereafter he was engaged in the practice of law in New Orleans, Louisiana and southern California. He is currently Adjunct Professor of English and Philosophy at Inner Mongolia University in China. In 2010 he was the English editor of China’s application to UNESCO for World Heritage Status of the Xanadu site in Inner Mongolia, granted by UNESCO in June of 2012. Professor Gonatar’s writings have appeared in Southwestern Journal of Philosophy, Tulane Studies in Philosophy, Plantation Society in the Americas, Loyola Law Review and New English Review. 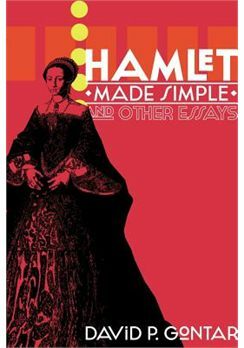 Hamlet Made Simple is published by New English Review Press. This whole mess ( 🙂 ) is thank to Jeremy Irons: he gave an interview about 5 years ago to a hungarian newspaper,stating that de Vere was Shakespeare. I began to search the net – the end of the story was The Monument for my 50th birthday. It wasn’t an easy job to get it through the Ocean / Nature / Time, but my heroic family did succeed. It’s more than two years now, and virtually no day would pass away without reading at least 2-3 passages. I hope no more words needed. I mentioned previously, my Christmas present was from my daughter a hand-made-printed-bound Quarto. Hank, I’m planning to send it to you, for signing it 🙂 It’s a project for this year – if you’ll be so kind as to help me. There were soo many candidates that I didn’t believed too much at first sight. I ready arguments from Oxfordians, Baconians, Marlovians and Derbyans and Oxfordians’ arguments were the best. But then the others? Whittemore helped me in this. Now, in this line, I thank to him and I’m really glad for his book begin praised. Thanks again, Francisco. A friend and colleague, Chuck Berney, once gave a wonderful talk, a story he had written, about the Round Earth Society (not many members at the time) having much fun meeting with each other and talking over things with great passion and laughter and “aha” moments. But then the Flat Earth Professors suddenly realized the earth is round and immediately changed all the books and all the lectures and took the whole thing for themselves, so the little Round Earth Society fighting the big guys was no longer in business. It was a great story. I might add to it, however, by saying that the new teachings of the Round Earth Academy would quickly turn the Oxfordian paradigm into a stifling set of answers, right ones and wrong ones, complete with its own censorship and stifling rules, thereby taking the life out of it anyway. So, really, the Round Earth folks would still be business, since they could get together and talk about all the great stuff that the Orthodox Academy of the Round Earth was avoiding and suppressing. Thank you Hank, I’ve already written to you. In change ( 🙂 ) let me show you some new idea. About the last two lines of sonnet 126 there was a lengthy discussion here, perhaps I didn’t go to your nerves 🙂 But suddenly something came to my mind. There’s a word, the pronunciation of which is rather similar to Quietus – as Quietus is capitalized and italicized in the Quarto, we may suspect, that Oxford intended a second, hidden meaning to it, knowing how much he liked puns. Well, Hamlet refers to the fact that a man “might his quietus make with a bare bodkin” — he might kill himself with an unsheathed dagger. His quietus is a kind of release, a letting-go, in this case of his own life, and it comes from the legal phrase “quietus est” or “He is quit.” Your idea would add to that, with no conflict. Where sweet swan’s are chased by Oxford’s big hound. Ha! Thanks for writing and posting it. In The Monument you write about the meaning of statute (from that age): ‘a law or decree made by a sovereign or a legislative authority’. Let’s then place this word to the first line. Let’s take the meaning of overturn in this sense: invalidate, reverse (a sentence from the net:’the bill was passed in the Commons but overturned in the Lords’). Let’s take the decree (or statute…) from that age, which you mention in The Monument: only the Queen’s ‘natural issue’ is legal heir to the throne. And if we add all this up, we get the meaning of the line that the sad and bloody war against Southampton (and Essex) invalidated Southampton’s declared right (to the throne). Could the “Statue” from the verses you cited, following the logic that this “statue” a more political meaning, be a reference to 1571 decree. I call “1571 decree” to the Act of Treason that was wrote in 1571. By Ceci’s orders, this Act was wrotten but there is a passage which make clear, to the heirs of the Virgin Queen, it is “lawfully begotten” every “natural issue from her Maj’s body”. Curiosly, in December of this same year, Oxford married Cecil’s daughter. yes in a sense. The cunning Robert Cecil knew how to get rid of Essex – and with him of course Southampton, the ‘natural issue’ of the Queen. For his (Cecil’s) power to retain he had to wage a hidden but very successful war against them, the final battle being the Rebellion. In this meaning yes, this wasteful war did lead to overturn the statute, the decree of 1571. Wow, it’s very possible. Even when wasteful war shall “statutes” overturn — I wouldn’t bet against it. Can I make a question apart of Sonnet 126′ ()s matter? Whittemore, I want to ask you (everyone can answer me too) if Edward de Vere was a catholic? Many critics are thinking in an old question: was Shakespeare even religious? Some had argued that the best writter of all time was catholic and that he may have been part of a group of catholics in England during Elizabeth’s reign who run from this country to Rome, where they could practic their catholicism as their liked and then come back to England. Some Stratfordian says that this the answer to Shakespeare’s knowledge of Italy. But I’m confuse right now :P.
There were rumors that Oxford was a catholic though himself did revelead a catholic conspiration against the Queen. Yet, as I believe that Oxford wrote Marlowe’s works, then I think that maybe his pseudonyms were some kind of alter-egos and heteronyms to him, lke the portuguese Fernando Pessoa did. I think Oxford could had used Marlowe to explain his ideas as an atheist and epicurist and Shake-Speare to talk with catholic voice. my message disappeared in the thin air, so I must repeat it 🙂 So, Oxford was among the men, who sent to death Mary Stuart, the catholic queen of the catholic Scotland. It’s hardly imaginable to me that Oxford was an ardent catholic. Well I do believe Oxford was conflicted in many ways, or let us say complicated as we should expect, and that he used different voices to express different sides of himself. I think he may have done this as Immerito (Spenser) in those public letters to Harvey in 1580, with Harvey playing along. These are outrageously funny if looked at from this perspective. In the pamphlet wars, again, not sure, but there is an opportunity, as in the use other made-up names or real names. As for Catholicism, well, it was an ancient heritage, no? And it was part of the Renaissance culture in terms of music, art, architecture and so on. I would think Oxford was more agnostic than anything else and drew upon Catholic writings and symbols as he did from Roman and Greek mythologies. And Hebrew, I think, etc. I believe he used the Christ images in the sonnets to express his own sufferings — the height of ego, except if he felt himself a king, and if royalty and royal blood was his real “religion” — a religion that was alive on earth. Kings were gods on earth; the queen was Heaven and a goddess. All a great pot of soup with usable ingredients. Didn’t Oxford translated the Bible too? The Genova Bible? Wasn’t it from Hebrew to English? He was a bible expert for sure. We have the one document of him buying a Geneva bible at age nineteen. Some believe he lived beyond 1604 until, say, 1608-09, on the Isle of Man (Derby) or the Forest of Essex, custody of which he had transferred to Bridget’s husband and also cousin Francis Vere — lived long enough to help mightily with the King James Version, which was published in 1611. Curiously the Hampton Court conference to launch the KJV effort was in January 1604, when Oxford was still definitely alive. He may have worked on translations for many years. The Shakespeare works show many many familiarities with biblical texts. I said agnostic but maybe I meant that he cared little for the religious institutions as such, or the organized religions, all run by men and susceptible to the same human foibles. But he must have loved the grandeur of the Catholic church’s music, etc. I would say he was very spiritual, but it was all blended together with the royalty, the noble lines, the history. It must have been a crazy time after Henry VIII broke with the pope. Then with Mary Tudor as queen, turning it back to Catholic, and that was when Oxford was three? And it was a Catholic country again until he was nine? Formative years. He also seems to have been very close to the Howard cousins, and other Catholic relatives. Even Elizabeth was conflicted. But I believe that above all he pledged his allegiance to the queen and to the stability of the state. But there’s another capitalized and italicized word there: Mars. (The double-dot is clearly visible in the original Quarto, and I find it extremely important). ‘Nor mars his word…’ – that is it will not batter, spoil or ruin the words OF WHAT? DOUBLE-DOT: the living record of your memory. So it’s (in my opinion) a pun, expressing that this monument being created will stand against debasing, defacing ages (and Cecil of course). I think is normal “Mars” appearead italicized. In Sonnet 153, “Dian’s” and “Cupid” are italicized (though them are clear references to Elizabeth and Southampton). I have already read poems of Elizabethean England and when pagan gods were named their names appeared italicized. But I can’t find “Mars” in this poem capitalized in the 1609 Quarto. Yet, I think I can recomend you to read Ricardo Mena’s blog “Shakespeare Said It To Me”. I know it can be strange saying this, but Mena is making a very good and credible effort in proving John Donne as the poet behind the lascivious Thomas Nashe and the legendary Edmund Spenser, both poets with a very misterious biography. Mena says that Donne and Oxford must had knew each other and they had a relationship of apprendice and master. Certainnly, they were very connected behind their masks. – Spenser’s Britomart’s name is delivered of the minoan goddess connected to nature. But her true name is Britomartis. Critics had suggested that Spenser changed the name with some kind of second intention, maybe because of the decassilabes of his epic poem. Critics have though too Britomart to be a reference not only to Queen Elizabeth’s chastity but too to the military power of England. Britomart’s name could be changed to make a pun on the latim “Mart” = “Mars” and “Briton” = “Britan”. The name can be translated as “Britain’s Mars”. The Queen is “Britain’s Mars” or the Queen and Warrior that fought and defended her kingdom with her own life. If we believe Oxford helped Donne in the composition of Spenser’s poem, then I think it can be plausible saying the “Mars” from Sonnet 55 is the same “Mars” pun intented in Britomart’s name. The sword is cleary a weapon which bring death with it. I think the verse “Now Mars his sword” have something to do with Elizabeth (Britain’s MARS) and the beheading Southampton as a traitor (the hatched turns into a sword; Oxford is cleary blaming Elizabeth for Southampton’s death [if he real die] like if she killed him with her own hands). Hank, Please keep me informed. Will do, Sander, and good to hear from you! Keep up the blog!!! Dam the censers, full speed ahead.